Conisbee Consulting Structural Engineers gave all their time and expertise free to the KX green sculpture project to make sure it is structurally sound (http://www.conisbee.co.uk/). Tracy looks after marketing at Conisbee, she took these photos this week, rather wonderful we feel. 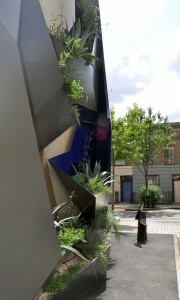 They show Neil Ayling’s sculpture and Marie Clarke’s planting design off to a tee. See more of Tracy’s photos on our Facebook page.